Yet PowerPoint, which was created over 30 years ago, hasn’t changed all that much. It may have gotten fancier, with smarter graphics and cooler animations, and it’s pretty easy to use, which is why everyone uses it. But for companies, the fact that everyone is using it is a problem. Yes, PowerPoint has been around longer than many of us, and there are some interesting stories about how PowerPoint was created, and how it was named. Back in the late eighties we laughed at our science teachers when they burned themselves on an overhead projector or fumbled with their clear, handwritten sheets so they weren’t projecting their notes upside and backwards. What a relief when PowerPoint came to our rescue… well not exactly. Then one morning, when I was taking a shower (where most of history’s great discoveries seem to have occurred), I thought of the name PowerPoint, for no obvious reason. Yes, PowerPoint does have so much baggage for the last many years. Some of this baggage can be an advantage, and some can clearly be an issue! Inside most companies, PowerPoint is a tangled nightmare – like old wiring behind the walls just waiting to short-circuit. Too many people use too many decks with too many messages that are out of date, don’t match, or even conflict with each other. Need a critical slide at the last second? Good luck finding it. Over 30 million PowerPoint presentations are created every day, constantly adding to the knotty buildup of slides and decks sitting on individual hard drives. Clearly, there needs to be a better way – a way that takes advantage of innovative technologies like cloud and machine learning – for a company to manage such an important asset. Presentations are for people who need to understand, act and react. That’s how things get done in business. Every business discipline, whether sales, training, research, investor relations, product development or human resources, relies on PowerPoint as a way to reinforce important messages. The CEO’s five-year projection, the salesperson’s pitch to a prospect, the brand director’s marketing plan, the trainer’s lecture to a group of new hires working to get certified – they all use PowerPoint to get their message across. This holds true across industries. Financial institutions rely on decks packed with detailed data to raise money, announce quarterly earnings, present research analysis and market trends, and to communicate portfolio gains and losses to their clientele. Travel and hospitality reps use presentations with glorious photos and videos of their luxurious properties in exotic locations to convince travel agents and potential customers that they should spend their limited free time there. What better way to sell a vacation than to show a sandy beach with crystal blue water? Media companies rely on presentations with authentic pictures of their target consumer, combined with charts describing how their network delivers that very same person. Consultants like McKinsey & Co. and Gartner Inc., generate hundreds of millions of dollars selling their decks of research, analysis and forecasts to their corporate clients. The military is known for its reliance on PowerPoint decks. The most notorious is Gen. Stanley McChrystal’s slide that he used at a military briefing in 2009 to describe the complexity of the situation in Afghanistan. “When we understand that slide, we’ll have won the war,” he said at the time. McChrystal’s slide, though, shows why we rely on PowerPoint so much:It is visual. Hear a piece of information and, three days later, you will remember 10 percent of it. Add a picture and you’ll remember 65 percent. A good 90 percent of the information processed by the brain is visual, according to the book Brain Rules by Dr. John Medina. Visual slides are absolutely critical to getting a message across, especially when the stakes are high. As you no doubt have noticed if you’ve ever sat through a typical PowerPoint presentation, people don’t pay attention to boring things. You’ve got seconds to grab someone’s attention and only 10 minutes to keep it. At 9 minutes and 59 seconds, something must be done to regain attention and restart the clock–something emotional and relevant. Also, the brain needs a break. That’s why I use stories in this book to make many of my points. Dr. John Medina’s thought about using stories works so well with the next post of this Presentation Management series, in which we will look at visual storytelling. AlexAnndra Ontra, co-founder of Shufflrr, is a leading advocate for presentation management. She has been providing presentation technology and consulting services to global enterprises for over 15 years. At Shufflrr, Alex advises Shufflrr clients through the process: from trial, to content architecture, through the launch, training and then on-going software upgrades. She’s hands-on. She is a leading expert in presentation management strategy, implementation, and adaptation. James Ontra is co-founder and CEO of Shufflrr. His 30-year career has focused on the highest profile presentations for world class companies. His clients have included: American Express, Bloomberg, Epcot Center, Mercedes Benz, NBC Olympics, Warner Bros. and many more. His vision and strategy have been driving Presentation Management to become a recognized communication discipline. James combined this passion with technical development to build Shufflrr. Presentation Management is smart communication strategy. 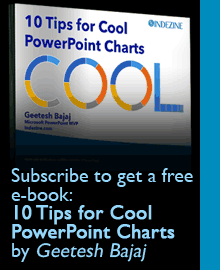 Geetesh Bajaj is an awarded Microsoft PowerPoint MVP (Most Valuable Professional), and has been designing and training with PowerPoint for more than two decades. He heads Indezine, a presentation design studio and content development organization based out of Hyderabad, India. Geetesh believes that any PowerPoint presentation is a sum of its elements–these elements include abstract elements like story, consistency, and interactivity — and also slide elements like shapes, graphics, charts, text, sound, video, and animation. He explains how these elements work together in his training sessions. He has also authored six books on PowerPoint and Microsoft Office.